Independent Contractor on a six-month contract to analyze the Mount’s website for navigational problems, usability, and audience targeting, and to propose a redesign for Site Executive, their content management system. Development included creative direction, design, and project management outlining time lines and deliverables; social networking marketing; template corrections for search engine optimization and Section 508 compatibility; used Google Analytics reworked to isolate on-campus IP addresses and to automatically generate monthly reports with asynchronous link and ad campaign tracking for Admissions and Marketing. On their current site one can see that they used some of the design elements, and most of the navigation structure and information architecture that I recommended. 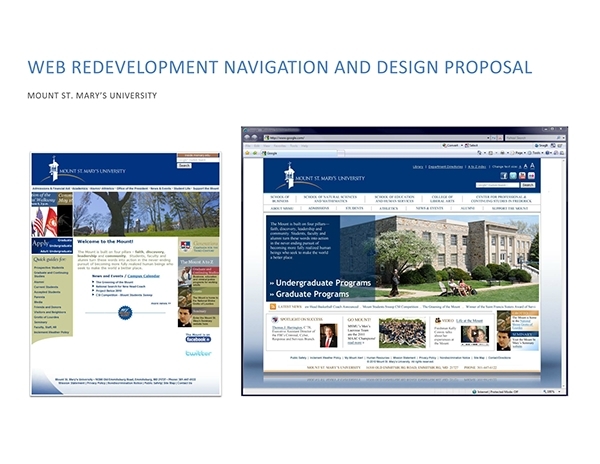 Mount St. Mary’s University, Emmitsburg, MD 01/2010 – 06/2010 www.msmary.edu Web Consultant Independent Contractor on a six-month contract to analyze the Mount’s website for navigational problems, usability, and audience targeting, and to propose a redesign for Site Executive, their content management system. Development included creative direction, design, and project management outlining time lines and deliverables; social networking marketing; template corrections for search engine optimization and Section 508 compatibility; used Google Analytics reworked to isolate on-campus IP addresses and to automatically generate monthly reports with asynchronous link and ad campaign tracking for Admissions and Marketing.